Today is the launch of a fun, fashionable, and light experience will be hitting Harvey Nichols food markets fridges and shelves…Jean Paul Gaultier has collaborated with Diet Coke to create the most fashionable and fun of all soft drinks. 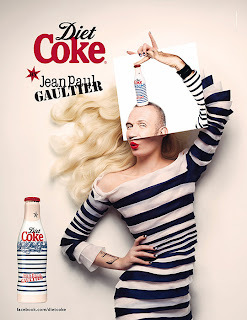 Gaultier has designed night corsets and day sailor stripes bottles for Diet Coke. The collection of the bottles went on launch after Harvey Nichols London store held a press launch night, on Thursday with a party in full swing of guests including press, the man himself Jean Paul Gaultier and fashion journalist for the Telegraph Hilary Alexander, and burlesque dancers. These coke collective items can be purchased at £1.95 or a limited edition collector’s box at £19.95. Harvey Nichols Knightsbridge, Bristol, Dublin, Manchester, Edinburgh, Birmingham, and Leeds food markets will have these on sales starting today. So head on down to get the most fashionable, fun, light experience at your local Harvey Nichols.